Week 8: Wineteer crew focuses on the details in lounge renovation. Wineteer Construction is proud to be selected as the construction partner for Avenues Bistro, located in the heart of Brookside in Kansas City. Avenues Bistro will be opening L’Cove, a lounge located directly next door to the current space, serving cocktails, desserts and other sumptuous dining options. To showcase the work Wineteer does from the inside out, we are posting pictures of the progress on a regular basis. With another week closer to the opening of L’Cove, the Wineteer Construction crew is focusing on the details—stringing wires and placing recessed lighting. The work is really a balancing act, as the space fills up with equipment…and many ladders. Week 1: Wineteer Construction reveals renovation…every step of the way. 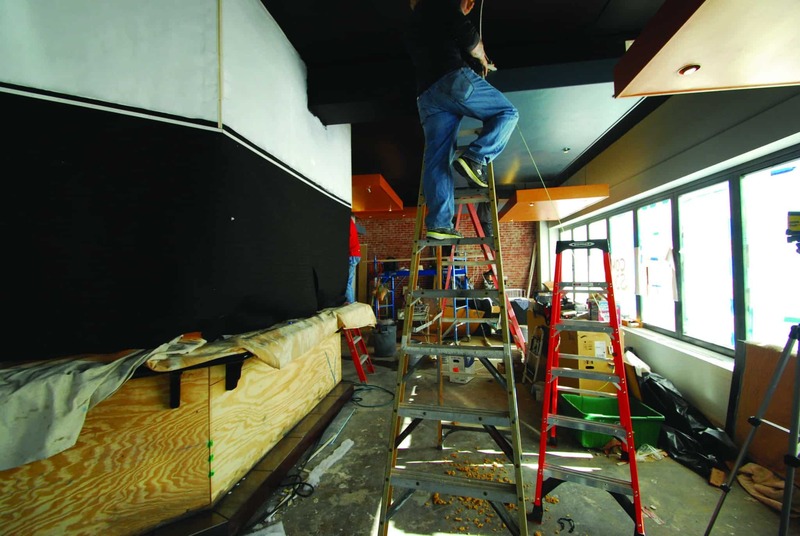 Week 3: Avenues Bistro renovation project takes shape in week three. Week 4: The vibe of L’Cove is pieced together. Week 7: Wineteer elevates lounge space to the next level.